One Of Our Absolute Fave Restaurants Is About To Go Next Level! We’re the first to admit we have a soft spot for Palm Beach’s 8th Ave. Terrace. Quickly garnering a loyal local following since their opening late last year, 8th Ave. Terrace has been knocking it out of the park with a refined yet casual menu, thoughtful cocktails, and cool vibes, all served with friendly and flawless service. Though it appears this young and dynamic team were only warming up, and are just about to take things to the next level; raising the bar yet another notch for the blossoming southern end of the Gold Coast. 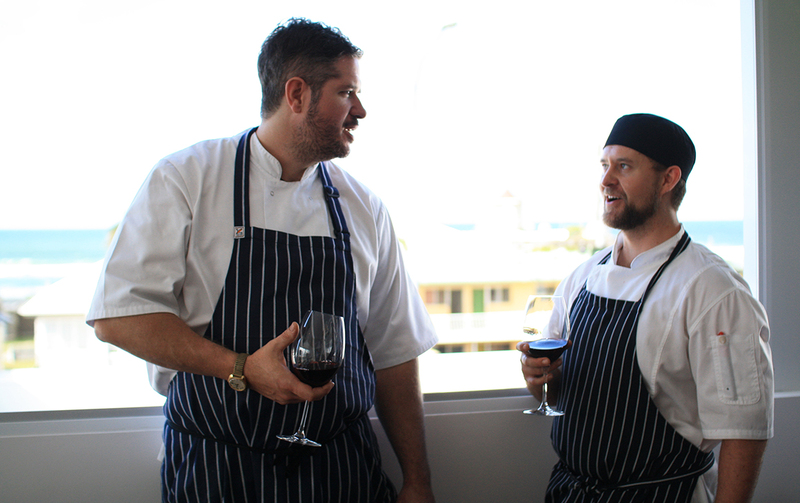 In what was an honourable move by 8th Ave.’s existing talented kitchen team, Chef Glenn Burnett and Chef Nick Stewart put their hands up to say they wanted to expand their skills even further. That’s where Chef Chris Harrington comes in. With a career spanning 20 years, from London Michelin Star restaurant The Greenhouse, and Tom Aiken’s flagship restaurant in Chelsea, to Byron Bay’s Dish and St Elmo, to co-founding, and recently selling, revered Lennox Heads restaurant, Foam. We sat down with the newest member of the 8th Ave. family, to chat about passions, travels, and finally finding work-life balance. Still yet to wine and dine at this southern belle? Srsly, what are you waiting for? I’ve been cooking for 21 years now. I always think my family, especially my mum, grandma, and grandad, got me into cooking. Grandad was a fisherman in Townsville and I always remember the times we went mud crabbing, or catching fresh prawns and fresh fish; nan would always cook a duck on a Sunday. When I was nine, my parents took me to Thailand for six months, and that’s where I encountered all these incredible taste explosions. At the age of nine, and I was eating chilli every day, on every dish. I grew up in Darwin and you have all these different nationalities up there, so I got exposed to so many different cuisines at an early age. I don’t think I ever thought of being a chef when I was younger, it just sort of came about, because I always wanted to create things, make things, and cooking was the perfect opportunity. I guess my food philosophy is to cook food from the heart, and food that I love to eat. Everything on our new menu are dishes that I would go out and order myself. At Foam in Lennox, we had a massive local following, so we’d change the menu regularly. People would come in every week because they could always try something different. What drew you to work with the 8th Ave. Terrace team? I’ve known Jordie for several years, and Bubbles (Krista) used to live with me in Byron around 2008, where we worked together at a restaurant called Dish. When we put our restaurant up for sale recently, they jokingly asked if I’d come and work for them. My wife and I don’t really have ties to anywhere, we’ve always travelled, we’re sort of nomads. I’ve gone from doing 75 hours a week (at Foam) to less hours, they know I have a family, so I’ll get more family time, and hopefully I’ll now have time to use one of my four surfboards! I also really like that here at 8th Ave., it comes back to old school service; where people are met at the door, and when they leave they get a genuine goodbye. Customers are remembered, and they really appreciate that. The existing chef team is so hungry to learn from you. What skills will you share first? We’ve started baking our own bread. They were already doing this, but now we are making a different style of bread; we’ve also started making our own gnocchi from scratch. They already have great skills and experience, but now we’re working together to create new specials and to share ideas. What can people expect on their next visit to 8th Ave. Terrace? On prior menus, 95 per cent of goods were already produced in-house. But on their next visit they can expect a new menu, something different. We’re making our own kimchi, our own gnocchi. We’ll be experimenting with new things; dishes diners may not have seen before. I haven’t worked on the Coast before, and I don’t really look at other venues’ menus too much. We’re just focussing on what we’re doing here, not getting caught up in trends. We’ll have one or two specials each day, depending on what ingredients we can get access to. What’s your all-time favourite dish? My favourite dish to make? Cheese toasties, haha! It’s funny because, when living in Byron, Krista and I used to have a cheese toastie cook off on Sunday nights, with chef friends from around town. We’d get creative with the fillings, sometimes they were good, and sometimes they were terrible. Whoever was there would be the judging panel. When it comes to my favourite dish to eat? I’ll always remember when I was on holidays in the south of Spain, sitting on the beach in a little shack; they’d make me Paella and I’d be drinking a litre of beer, every day I was eating chorizo. That was definitely a favourite. Who is the most interesting person you’ve ever cooked for? That would have to be Bill Murray [think: Ghost Busters, Lost In Translation]. We catered for an event on a yacht during Venice Film Festival. I made lunch for about 30 of them; he came down the kitchen to help cook, which was quite funny. What are you looking forward to most about living on the Gold Coast? We’ve been living in small towns and travelling for so long. So, I’m looking forward to the ability to do more things, there are more facilities and variety on the Gold Coast that we can access. My wife is excited for the shopping and browsing opportunities, Wiggles are going on tour so I can now take my son, eventually I’d like to go to a footy game, and I really love Yum Cha so am keen to check out what’s available here. It’s been 20 years since I was up the top of Currumbin rock pools; I’m also excited to spend time with the 8th Ave. team and, most of all, just more time with my family. To sleep in! Which never happens anyway as my son wakes me up between 5am and 6am. My ideal day off would be to wake up without any plans and just doing nothing. Or, otherwise we’d go for breakfast somewhere, sit on the beach, go for a surf, go for lunch, do no housework. I haven’t had much time for it, but I do woodwork and make tables and other furniture, so I’m hoping I’ll now have time to get back into that. Are you hungry yet? Read more about Chris and the legendary 8th Ave. Terrace team here.